South Carolina boasts the oldest Jewish community in the South with Jews first settling in the port city of Charleston in the late 17th century. Charleston emerged as one of the leading centers of American Jewish life during the 18th century, and as late as 1820 the city was home to the largest Jewish community in the country. Charleston Jews founded Kahal Kadosh Beth Elohim in 1749, the second Jewish congregation established in the South. 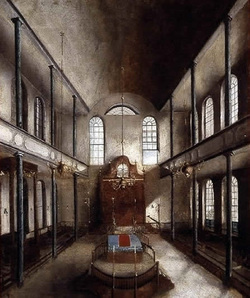 Charleston was also home to the first Reform congregation in the country, when local Jews founded the short-lived Reformed Society of Israelites in 1824. Orthodox Jews established a congregation in Charleston in 1854. During the colonial and early republic eras, Jews also lived in Beaufort, Camden, and Georgetown, though they would not establish congregations in these towns for another century. Despite Charleston’s long Jewish history, only one other South Carolina congregation, in Columbia (1846), was founded before the Civil War. Most South Carolina Jews were strong supporters of the Confederacy. In Charleston, 81% of Jewish households owned slaves while over 180 Charleston Jews fought for the South during the Civil War. Benjamin Mordecai gave $10,000 to South Carolina to help support the southern war effort and also established a charity to help take care of soldiers’ families. Simon Baruch of Camden served as a surgeon in the Confederate army. Though he originally opposed secession, Andrew Jackson Moses of Sumter served in the home guards while five of his sons fought for the Confederacy. After the war, Jewish congregations were founded in Camden (1877), Florence (1887), and Sumter (1887). In the years after the Civil War, Jewish immigrants began to settle throughout South Carolina with most opening retail businesses. Some of these businesses lasted for generations. Henry Berlinsky opened a clothing store in Charleston in 1883; his grandson Henry Berlin, still ran Berlin’s Clothing Store in 2005. In Spartanburg, Moses Greenwald opened a men’s clothing store in 1886, which remained in operation until 1991. 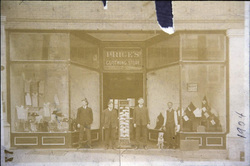 Harry Price’s clothing store, which he opened in 1903, is still run by the family today in Spartanburg. Sam Fleishman opened a general merchandise store in Anderson in 1906 that was later taken over by his nephew Nathan Fleishman. Nathan’s son Alvin later ran Fleishman’s, until it closed in 1981. The state’s Jewish population grew significantly in the early 20th century as a new wave of immigrants from Eastern Europe settled in South Carolina. Between 1907 and 1927, the state’s Jewish population grew from 2,500 people to 6,851. The impact of this growth was widely dispersed throughout the state as Jews established new congregations in Georgetown (1904), Orangeburg (1904), Darlington (1905), Beaufort (1905), Greenville (1910), Spartanburg (1912), Dillon (1915), Aiken (1921), and Bishopville (1925). Jewish legislators stand in front of the state capitol. Photo by Bill Aron. South Carolina Jews have had a long tradition of political involvement in the state. Francis Salvador, a strong supporter of independence from England, served in the first provisional congress in South Carolina in 1774 and later in the state assembly. Salvador was the first practicing Jew to serve in a legislative body in America. Tragically, Salvador was killed during the early years of the Revolutionary War. As early as 1833, Mordecai DeLeon was elected mayor of Columbia. In 1850, Henry Lyons became the state capital’s second Jewish mayor. Jews have served as mayor of several different South Carolina cities, including Georgetown, Kingstree, Greenville, Eutawville, Latta, Florence, Lake City, Darlington, Manning, and Sumter. Franklin Moses was elected to the state senate from Sumter in the years before the Civil War. During the Reconstruction era, he served as the Chief Justice of the South Carolina Supreme Court. His son, Franklin Moses, Jr., who was not raised Jewish, become a controversial Reconstruction-era governor of South Carolina. 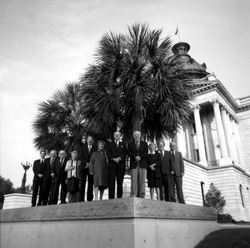 Several South Carolina Jews have served in the state legislature, including Sylvia Dreyfus of Greenville, Irene Krugman Rudnick of Aiken, Matthew Poliakoff of Spartanburg, Harriet Keyserling and her son William Keyserling of Beaufort, Hyman Rubin and Isadore Lourie of Columbia, and Leonard Krawcheck and Arnold Goodstein of Charleston. Sol Blatt of Blackville was the Speaker of the House for more than three decades. After World War II, the Jewish community of South Carolina continued to grow, reaching 8,660 people by 1980. 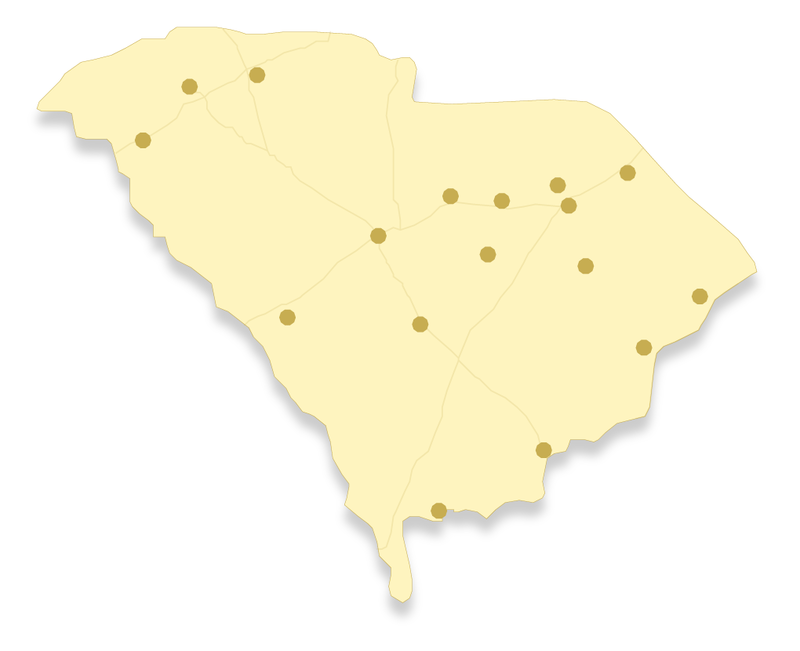 New congregations were established in Anderson (1930s) and Kingstree (1945). One factor in this growth was the arrival of manufacturing businesses, several of which were owned by Jews, mostly from the North. Among the first was the Piedmont Shirt Company, started by Shepard Saltzman, who moved to Greenville from New York in the late 1920s. Bill and Elaine Epstein moved to Anderson in 1953 and opened a ladies apparel factory. The business, called the Iva Manufacturing Company, became quite successful, expanding to include six plants. Andrew Teszler opened the Butte Knitting Mill in Spartanburg, making women’s dresses. Often, these plants employed other Jews as managers and executives. Over the last several decades, the overall Jewish population of South Carolina has increased, though this growth has not benefitted every community. In several small towns, the Jewish community has shrunk and even disappeared. Jews in Darlington disbanded their congregation and joined Beth Israel in nearby Florence. 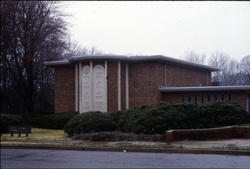 Dillon Jews closed their synagogue due to declining numbers in 1993. In 2004, Congregation Beth Or in Kingstree closed its doors and sold its synagogue. Some remaining congregations struggle to survive. In Camden, Temple Beth El is down to just a few members and only holds services on the high holidays. The Jewish communities in Orangeburg and Sumter face similar problems. Meanwhile, Jewish life is thriving in other parts of the state. New Jewish communities and congregations have been founded in Myrtle Beach (1963) and Hilton Head (1981). In 2011, an estimated 12,545 Jews lived in South Carolina, the most ever in the state’s history. The Columbia and Spartanburg Jewish communities in the 21st century have never been larger. In Greenville, the Jewish community has grown dramatically since the mid-1980s as the city’s overall population has swelled with newcomers. Most new Jewish residents in Greenville have been from the Northeast. The city’s two Jewish congregations are both flourishing. Today in Charleston, still the state’s largest Jewish community, an estimated 6000 Jews live in the city where Jewish life began in South Carolina over 300 years ago.